For many app developers, the only thing harder than getting users to install their app is getting them to continue using it. Branch is a great tool for driving continuing engagement over the entire user lifecycle, from onboarding to retention to re-engagement. Integrating the SDK and turning on deep links is the first step. Here are a few things we’ve seen drive successful user engagement for our partners. User retention begins at user acquisition. The hard truth is that most app downloads are shortly followed by an uninstall. This initial usage hurdle is nearly as big an obstacle as getting the user to download in the first place. Branch helps you get past that first big hurdle by giving you tools to make the initial experience more compelling. Every install that comes through a Branch link has a JSON object (basically a list that’s easy for a computer to read) passed into your app from our server as soon as the user launches for the first time. It includes how the link was created, who created it, and any campaign information or tags that were embedded. For a link created and shared by an end user, the social context we’re passing into your app is absolutely invaluable. Gogobot uses this information to customize the account creation screen- a picture of the user who sent the invite pops up and the incentive that the new user was promised is displayed. 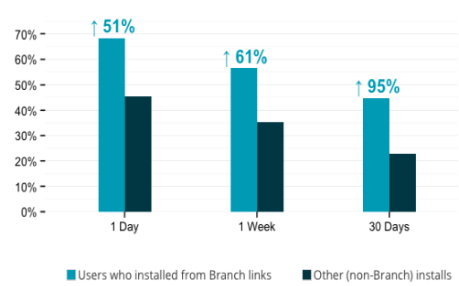 Their conversion from install to account sign up increased 78% as a result. This drives engagement in the short term and sets the tone for what users can expect from your app. Customizing sign up is very powerful, but it’s just the tip of the iceberg. Imagine you’re a book seller and you know that your new user came in following a link to one of Ursula LeGuin’s books. Right off the bat, you know that this is a user who is interested in science fiction and fantasy and who appreciates female writers. You can use that information to better select which books you show them. Combining Branch data about which books they interact with (sharing, clicking on shares from friends, driving their friends to install, etc) with the data you already have about their in-app behavior provides a treasure trove of opportunities to customize their experience and provide lasting value. That value is what will keep current users active and help you re-activate and re-engage users who fall off. These numbers didn’t happen by accident – the more you leverage the available tools to make your content relevant and valuable the stickier your app will be. Speaking of social data and sharing, there are few tools as powerful for driving re-engagement as positive reinforcement by friends and peers. By making it easy for people to share and rewarding them for doing so, you embed your app into the user’s social sphere. 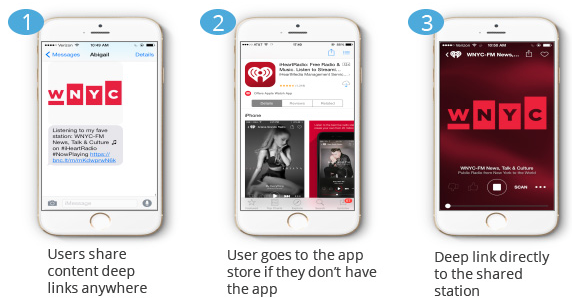 iHeartRadio (which streams radio stations from around the world) has done exactly this by allowing their millions of listeners to share not just their app but specific stations. Suddenly, radio stations are no longer limited to a single geographic area and friends who grew up listening to the same stations can still engage with those stations – and each other – even if they no longer live anywhere near each other. 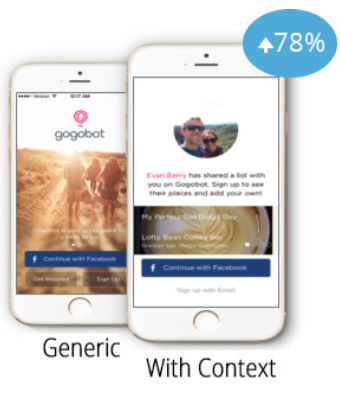 All of that interaction drives users right back into the app, over and over again. It’s relatively easy to drive web traffic because the ecosystem is mature and visiting a web page is low cost to the user – they don’t have to install anything and they can easily click away. At the same time, once they’ve made the decision to install a mobile app and gotten past the initial learning curve, mobile apps are stickier than mobile web. The recent white paper by comScore reinforces this point. Treat your mobile website as the top of your user acquisition funnel and leverage it to drive users to your app. So far so good – but how to get those mobile web users to change their habits and start using your app instead? Automatically redirecting users who have your app installed into that app when they visit your mobile site is a poor tactic that can backfire – especially if your mobile app doesn’t have all the same options and functionality as your mobile site. Users will often uninstall apps that do this because it denies them access to the missing functionality. In an ideal world, one would start by making sure your app has at least as much functionality as your mobile website, but at a minimum you can avoid loss by allowing users to make the choice themselves. Smart banners are an easy and non-intrusive way to prompt users to open the content in the mobile app without being pushy. This can help users get into the habit of going to the app and drive long-term engagement. 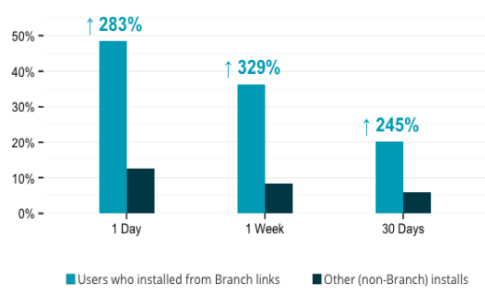 Branch links work everywhere, from email newsletters to SMS to in-app messaging. Users on desktop can be directed to the web content or prompted to text themselves an install link. Branch links embedded into the messaging in your A/B testing platform of choice can include embedded information about which version the user interacted with so you can optimize more quickly and accurately. You can also use Branch links behind the re-engagement ads offered by many of the mobile ad networks. Our intelligent routing makes sure that users who still have your app go directly to the promotion content and users who have uninstalled and decide to give you another try get the best re-onboarding experience possible. As a bonus, your mobile content can be automatically added to Spotlight search for iOS users and Google App Indexing for everyone else, so when your users search on those platforms, your content will appear and they can re-engage immediately. Have you had fantastic success or epic frustration re-engaging your users? We’d love to hear about it in the comments.